Team Building activities engage employees while enhancing individual employee motivation. 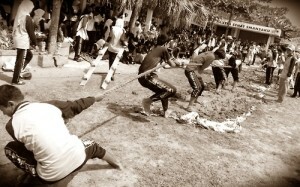 Think of team building as a titillating game of tug of war. Each employee grabs hold of the same end of rope, adamant on not letting go. Pulling relentlessly together as one cohesive force, they succeed as a team. The weight of succeeding is distributed appropriately within each individual. Team building activities are essential in having a cohesive, confident and harmonious workplace. These Four Team Building Activities are guaranteed to improve the work atmosphere, while instilling positive work mentalities. The famous phrase, “two brains are better than one” could not be more accurate when team building is on the table. Time to put on your thinking caps and dive into these exciting Team Building Activities your employees will love! It’s time for a field day! Change the dress shoes and heels into comfy sneakers. Team Building activity number one consists of engaging employees in outdoor, physical activity. After being separated into teams, employees need to work together as a team to complete a given Olympic game. Referencing back to the tug of war example, employees are motivated to break free from their shells and have fun, while also getting a great workout! Organized physical activity is a great way to break the ice! The second team building activity is a retreat. Retreats are excellent ways to isolate employees in an adjusted environment. These getaways are notoriously dreaded with monotonous exercises to ‘build trust’. Under these circumstances, disliking retreats is understandable. However, not all corporate retreats have to be that way. The remedy is finding a suitable retreat location that fits your organization. There are several different types of retreats employees or upper management could decide between: luxurious, outdoorsy, mountaintop… Wherever you decide to go, this team building exercise never fails! Close your eyes and allow your coworker’s voice to guide your feet. The trust walk is a powerful tool used to enhance relationships between others. Using verbal and nonverbal instructions, one employee directs another around pre-organized obstacles. Each pair will experience the thrill of being steered by another’s voice. The only option in this exercise is to trust that your partner will not guide you wrong direction. This simple team building activity really works to strengthen the bonds between individuals. The fourth team building activity tests how flexible, team oriented and mathematically qualified employees are while they race against the clock. The Spider Web exercise is compelling and unique within itself. Rope is tied to a metal frame in several spots in multiple angles. This creates the illusion of a roped spider web. There are companies who create these spider webs for inexpensive costs such as Team Craft. Using string, groups of four or more employees will maneuver through a spider web without passing through the same hole twice. This exercise requires employees to decipher who fits through what hole and in what particular order. Utilizing problem solving and critical thinking skills, employees begin to move through the spider web within a designated amount of time. Team Building Activities are fun ways to interact with employees. Bonding is not always easy to do, especially for introverts. This is why at cityHUNT it is our goal to find the best and most effective way to build long lasting relationships while having fun. Simple exercises like the Spider Web and the trust walks are inexpensive ways to form friendships. You should feel comfortable where you work and these four team building activities are just the fix! Check out similar previous cityHUNT events such as culinary adventures or visit our site at cityhunt.com!